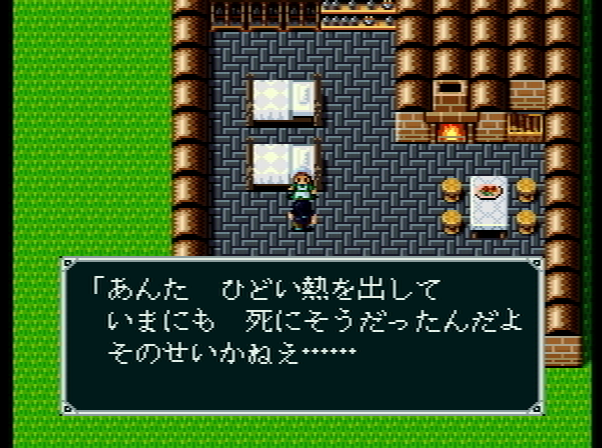 This is going to be a fairly short post because I have run into emulation errors, or perhaps a bad dump (although someone else has submitted this game as a bug in mednafen). The game is an action RPG that has a 2D platforming style, sort of like Exile. It is just as deadly as Ys, with enemies able to kill you instantly if you get too close. 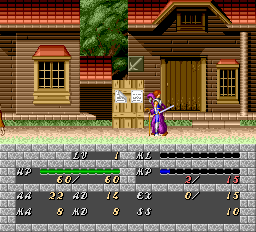 However, you can only save in towns, which increases the difficulty. One distinctive feature is that if your level is high enough, lower level monsters will not appear. So this prevents you from overlevelling but has the side effect of limiting the amount of money in the game -- something one of the walkthrough sites warns about. The emulation problem is that the movies don't play, or only a few images show from them. 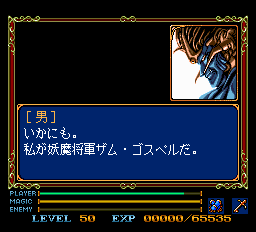 The game starts with a rather long opening scene, of which only a few parts can be seen (but the dialogue is audible). I watched this movie on youtube to begin. The backstory is that Auleria was a world where different races lived in harmony, but then the king was killed and five continents took their own routes, although the peace was kept by an alliance between the kingdoms. The story begins when a war is about to start between the kingdoms. One of the lords, Albert (who is a monster of some kind), is visited by a prophet Georg, who seems to be telling him that he can defeat the other kingdoms, starting with the weak "mouse" kingdom (just a metaphor). Albert's forces head out, as we switch to the main character. He lives in a little town; we see his friends and family, then he heads out to buy medicine from an nearby town. Of course while he's gone the enemies destroy the town and when he gets back, the entire place is a burning mess and everyone is dead. So the main character heads back to the nearby town to find out what happened. After poking around in the village, he heads off for the castle. Michael, the one survivor, went there to tell the king what happened. This is where the action starts -- it's just swinging your sword, basically. 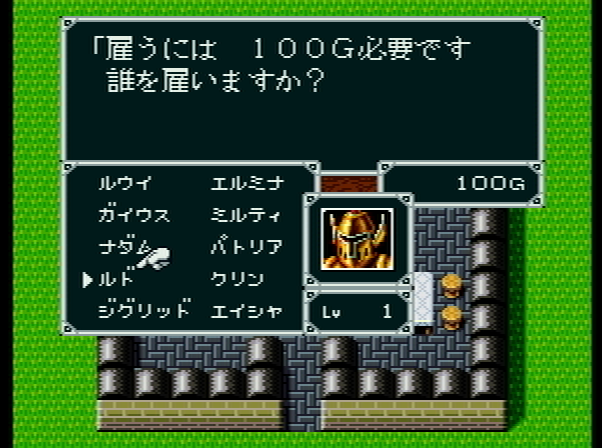 There's an MP gauge that lets you charge up and shoot some fire from your sword, but I didn't find that very useful. 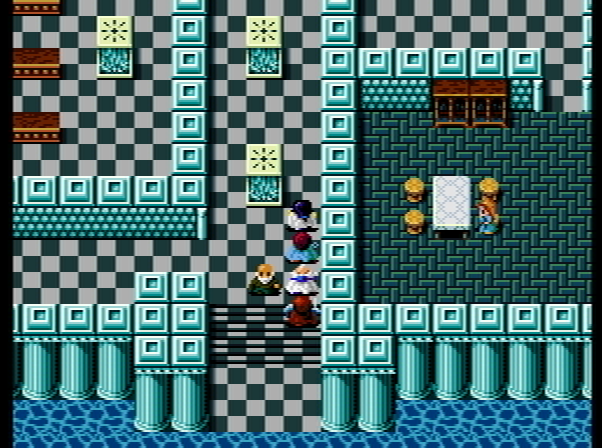 At the castle, our hero learns something of what happened (just that 5 magic monsters came to destroy the town). Michael tells him that his younger brother Karl might fight with the hero. But Karl says he wants Michael to come home first -- Michael has headed off to a cave, which is the first dungeon. I died a bunch of times in here, but after levelling and upgrading my gear I finally found Michael. Now Karl joins the team. At this point the game becomes a bit easier because you can switch between the hero and Karl, each with their own HP gauge. The next goal is to be able to pass the barrier to the next kingdom, but first you have to do a sidequest involving a crooked weapons dealer. This requires going back into the cave and exploring new areas and beating a boss. But after this a movie played that I couldn't see again, and I thought that was good enough. It's too bad the emulation didn't work, but this isn't that good of a game anyway. 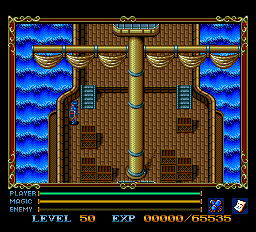 Next up is Tensi no Uta II, the sequel to the 1991 game I played earlier. There's also a slight change -- I think I'm going to skip Laplace no Ma for the PCE and play it when it comes up on the Super Famicom instead (despite being in some ways a different game). But I had Tengai Makyo Fuun Kabuki Den in the wrong place so that will be after Tenshi no Uta II. At the end of the last post I said this was a thoroughly average game -- it's perfectly playable, but hardly anything will wow you. Story/Characters: This is a weak part of the game. The characters barely exist, particularly your frequently rotating party members. The story is cookie cutter with no real twists, even in places where you might expect twists. World: Standard fantasy world -- a little disappointing from Yuto Ramon because GDLeen at least had some innovation but this is just like any other generic RPG world. Game Flow: Quite smooth. There are few places where you would even think of grinding,and it's never impossible to figure out what you should do next. System: It's mostly standard AMID, although the three parties (see intro post) keep it interesting. It's fun to try to level the mercenaries and jinzo because you have to be careful about which enemies you let them beat up on. You could easily beat the game without ever hiring a mercenary or getting a jinzo, but it wouldn't be as fun. Side Quests/Optional Content: There are some optional jinzo you can get through some bosses and other stuff, but that's it. Interface: I'm hoping that we're moving into an era of more modern interfaces. This has pretty much everything I would expect -- you can see the stats of equipment before you buy it, no inventory limit, easy equipment interface, etc. Graphics/Sound:The graphics are underwhelming. 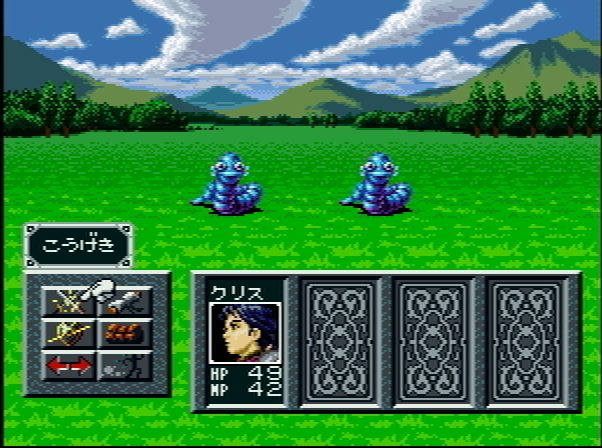 While the enemy sprites are decent, the rest of the graphics still look like the Famicom-era ones of the early SFC. The music is pretty good, though I didn't find any particularly memorable songs. Next up is the final set of 3 PC Engine games, then I will be caught up to where I am with SFC. The next SFC game will be Madara 2. This is a fairly short game, so I was able to finish it up in two posts. 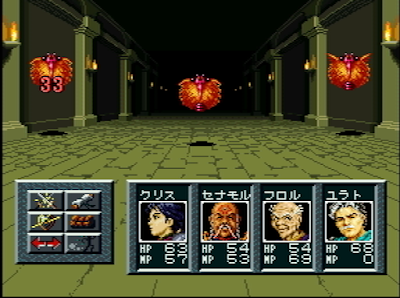 The three party system makes the random battles a little more interesting than the usual "mash attack" -- trying to level up the mercenaries and jinzos is fun, and they can act as meat shields in the battles as long as you don't let the mercenaries get killed. I was pretty successful until the very end. My very first hired person, Elmina, died on the last dungeon and I had to replace her. Sniff sniff. 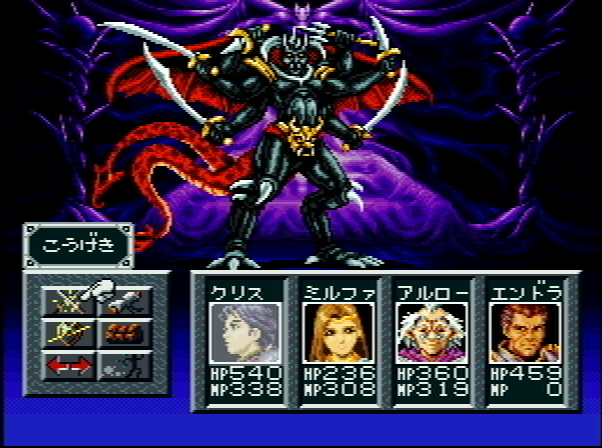 The enemies in this part of the game taken a sudden leap in difficulty, but I actually found it doable without grinding -- they give a lot of XP, and with judicious switching between the parties I was high enough level by the end of this dungeon to be able to beat the boss. One odd quirk of this game is that all the bosses, even the final boss, can be poisoned. They only lose 50 hp per turn max but every little bit helps. 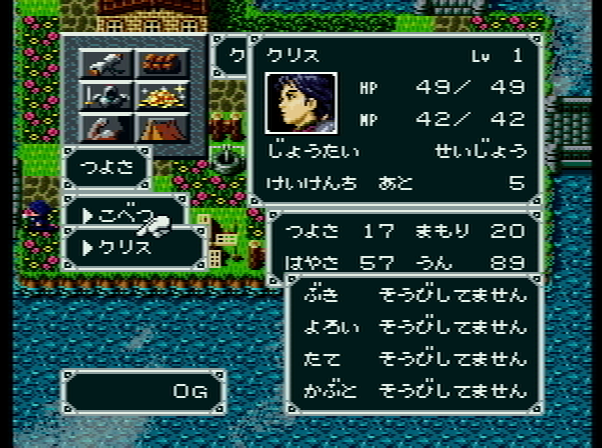 Now Endra joins the party along with underwater gear that will enable us to reach Olotria. Only one thing left -- we need a ship! Fortunately the mayor of a nearby town is happy to grant one to the Hero of Light. Now we can reach Olotria, but before that, let's go back to Kurisu's home town and find out what's his deal. Actually there's really no story there -- Kurisu left Dolun to try to defeat Zolde but his ship was destroyed. 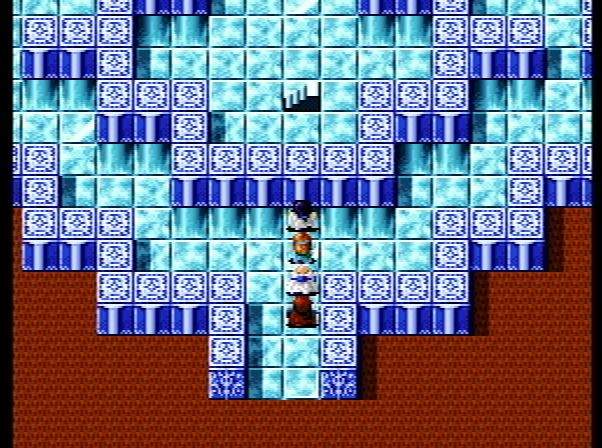 What is helpful here is an old man who tells us that we can't real Zolde's castle without going to four towers and beating the bosses there. But Milfa's power is necessary, so Olotria is next. With Milfa joining the team, the final party is complete. 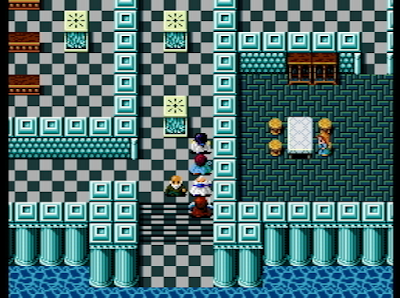 Now that Milfa is with us, the old man in Dolun will give us the Black Key, to open the first of the four towers. Here it's just four dungeons in a row -- each one has a boss, the key to the next tower, and some of the ultimate equipment for our heroes. None of it is especially hard. 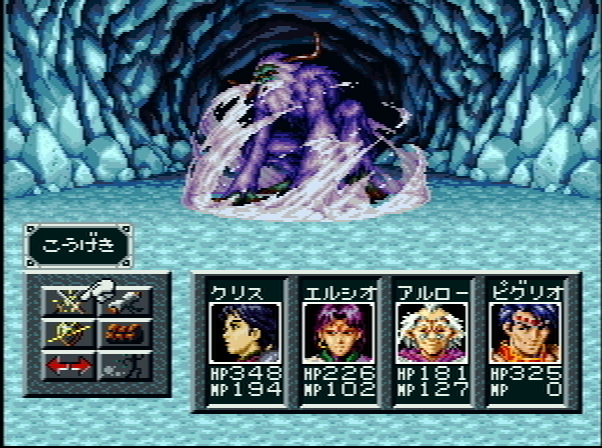 I used the same strategy on all these bosses -- Power Powder to increase attack, and Arlaw's defense spells, then poison. Then just attack and heal when necessary. 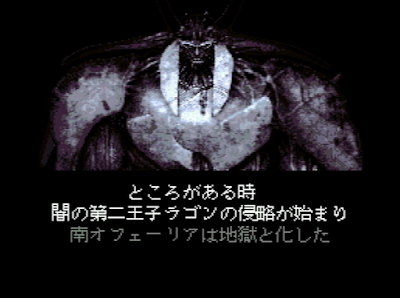 The final dungeon is quite short, with a few sub-bosses that aren't very difficult, and then Zolde himself. He has three forms, but none of them are very hard. 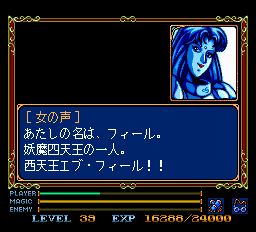 After being defeated, Zolde vows to come back some day as all stereotype villains do, and the game is over. This is pretty much the definition of an average RPG -- it's easy to pick up and play, has a few innovative features, an uninspired plot, and cookie cutter characters. 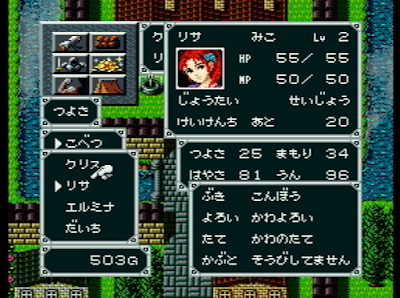 Nothing special, but if you're looking for old school RPGs it's worth a go, and it has a translation patch. 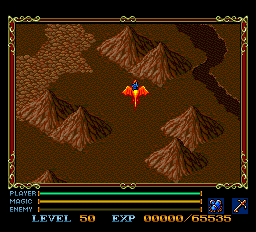 This is the third game in a series with Minelvaton Saga and Silva Saga I, and also has connections to GDLeen. All of them had scenarios by Yuto Ramon. The backstory in the manual is pretty standard for RPGs -- a world with the Light God Harn and the Dark God Zuhl (who was the final boss of GDLeen, at least an avatar of his). Harn won a huge war and ushered in an age of light, but Zuhl continues to affect the world and so heroes of light need to arise occasionally to defeat Zuhl's forces. The Dark Prince Lagon was defeated by Prince Leon of the Palmekia kingdom, in a story told in one of the novels. Then in Silva Saga 1 (for Famicom), Leon's grandson Kairal used the Sword of Light to once again defeat the darkness. This time, our hero is Kurisu (or Palsu in the instruction manual), who has washed up on the shore in Beta, a small village on a small island. Unfortunately the forces of Zuhl are attacking even here. Fortunately the woman who finds him gives him some basic equipment. He has amnesia and only remembers one thing: he needs to find Kairal, the Prince of Light who defeated Lagon (I think). The game looks a lot like Dragon Quest. The interface is clean and easy to use for the most part. You can see what the strengths of weapons and armor are when you buy them! You can search most things in towns and houses, and a lot of them give funny or interesting messages if there's nothing there. Sometimes you feel bad (I stole 120 gold from a house where the sick grandmother was being tended to by a daughter who had to work to support her). 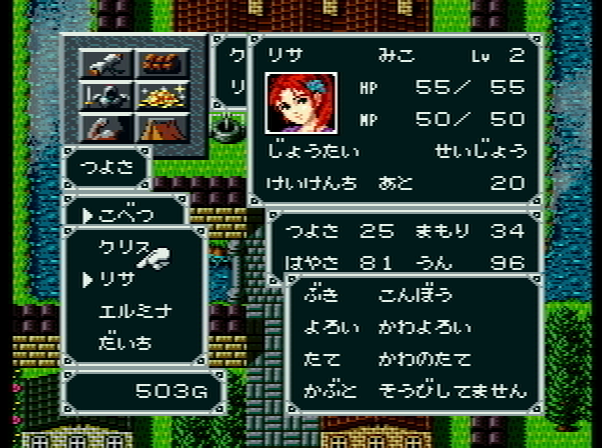 The opening town has no weapon shop, but it does have a mercenary hiring location, where I picked up my first companion, Elmina. Your main party, which is the usual RPG party. Mercenaries, who you hire at a mercenary place. As far as I can tell you never have to pay them again. They can only attack a random enemy, but recover all HP after a battle. If one of them dies, they're gone permanently. Jinzo (god statues). You find these in chests, and when they're high enough level you can combine them with other statues to make a new one. 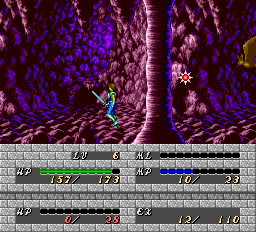 Like the mercenaries, you can't control them and they casts spells, and recover all HP/MP at the end of a battle. If they die they can be revived just like a normal party. Only the currently selected party gains XP at the end of the battle. You can't heal the mercenaries or the jinzo during the battle. 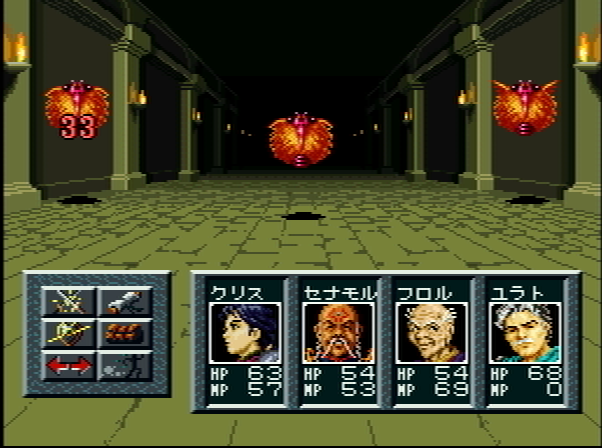 But this does give some interesting dimension to a system that's mostly just the basic AMID, although I have found that due to all your different party members, the mages have enough MP to actually use their spells. The main irritation is a system that I really hate -- when the main character's HP go to 0, it's automatic game over even if everyone else is alive. Fortunately death in this game is not a big problem; you get returned to the last place you saved your game but with no penalty (other than being removed from wherever you were). This is a good offset for the annoying luck that the main character death system can introduce. The first task is to do a little job for the mayor of Beta to prove yourself, and then he'll give Kurisu his canoe. Now with the canoe, Kurisu is able to set out on his quest to find Kairal. One odd feature of this game is how quickly people join and leave your party. Eventually (over halfway through) you get your final party, but before that it almost makes you dizzy how often people rotate. They share their skills and levels with the next person but you lose whatever you have equipped on them. Unfortunately this also means the characters are very underdeveloped (including the silent protagonist). The basic flow of the first part of the game is that Kurisu travels to a place hoping that Kairal will be there, only to hear that he's moved on. Generally there's some quest or dungeon to solve and then he'll be able to pass the next roadblock, or be given a warp item to go to another place. Along the way, Kurisu learns that the Zuhl activity is now being handled by Zolde, the older brother of Lagon, who is also stronger than Lagon. Finally, he discovers that Kairal was killed by Zolde, but that Kairal knew another "hero of light" candidate was following him. He leaves behind a message for Kurisu, to find the Equipment of Light in order to be qualified to become a new Hero of Light. This just involves going to three different dungeons and getting the shield, sword, and armor of light (none of which can be equipped). 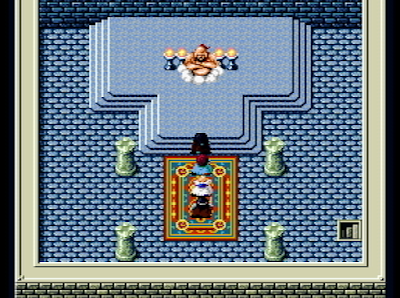 Then we head to a shrine where the god Harn appears and grants Kurisu the power of the Hero of Light. Becoming the Hero of Light raises Kurisu 10 levels, and also grants a new sprite (although the face picture on the status screen is the same). 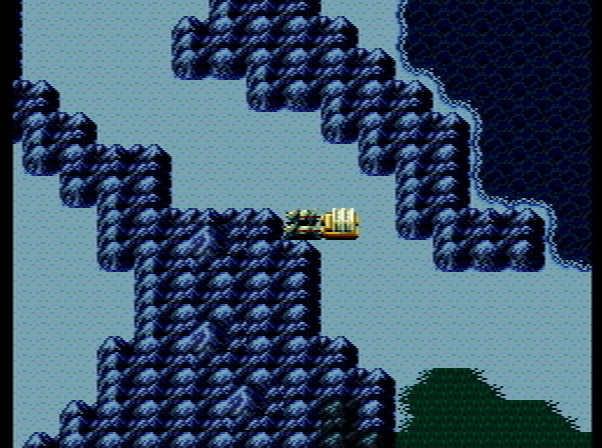 Now all that remains is to kill Zolde, but of course it's not that easy. We still have the problem of Kurisu's loss of memory, and how can we break into the castle where Zolde is? Stay tuned! I currently have posts scheduled for this blog through the beginning of August, so I thought this would be a good time to start a side project alongside this blog. 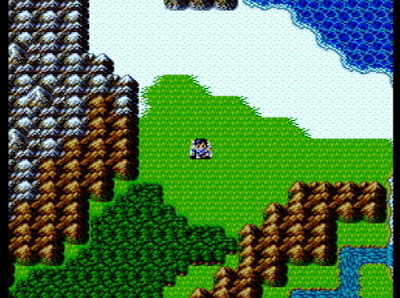 I've been getting slightly burned out on these PCE and SFC games because so many of them are the same basic Dragon Quest-style games with only minor innovations. I absolutely do not want to stop doing this blog, but I want to have another project to alternate with to alleviate some of the tedium. 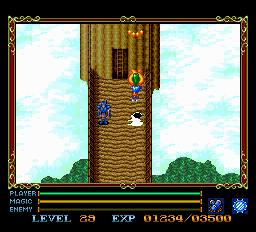 My main game love has been for strategy RPGs ever since I played Shining Force in high school. One of my disappointments with this blog is that I've played so few of them -- in fact, the only SRPG so far was Albert Odyssey, which sucked. So I have started This Map is Completed!, a chronogaming blog for strategy RPGs. 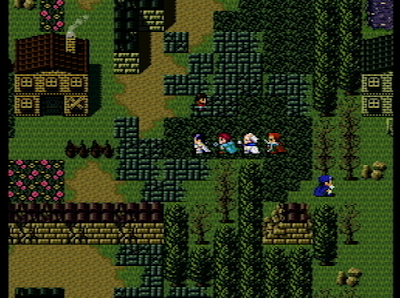 Right now I'm playing Fire Emblem 1 for the Famicom, and I have the introduction and first post up. On this blog, Silva Saga II will begin on Saturday and run for two weeks before returning to PCE games. 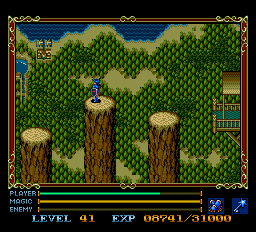 Unfortunately emulation problems made it so I could only play a short amount of Gensou Tairiku Auleria, but Tenshi no Uta II seems like a promising game (having played the first section). This block of PCE games is 3 for 3 on ports of computer games. 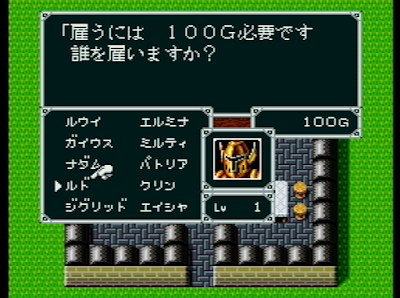 I played Xak I for Super Famicom earlier in this blog. However, only the first game was released for SFC. This was actually the last straw that encouraged me to add PCE games to this blog; I kept encountering games that were only partly released for SFC or that had superior PCE versions. In this case, I actually think the SFC version is better in every way with one exception. As I mentioned in the above review, this game is clearly inspired by Ys to the point of being a ripoff. It's nowhere as good as Ys in any respect, but it echoes it in almost every way. 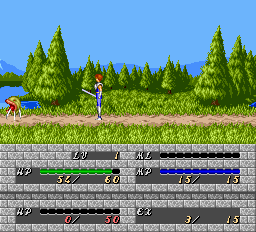 The SFC version had completely changed the battle system to a "swing your sword" type of RPG, but the PCE version retains the original "run into enemies" system that it shares with Ys. Obviously this was developed to save resources on the PC. 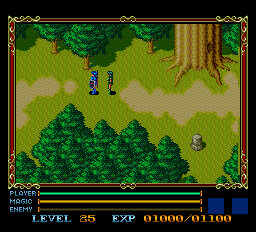 The main difference is that in Xak you have to hold a button down to have your sword out. If you're high enough level you can just run into the enemies and they'll die. 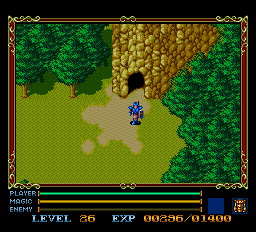 I won't cover Xak I again; it's the same as the SFC version. On the whole it's much easier than the SFC version, especially the annoying dragon riding section that I criticized in my SFC review. The PCE version is very short and the final dragon boss dies literally in one shot. Like Ys you get a lot of random game overs when enemies trap you or you approach the enemies the wrong way, but you can save anywhere and the game goes by quickly. 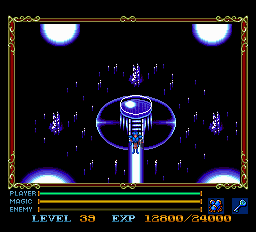 Part of the reason I wanted to play Xak II is that it seemed like they left a lot of story elements hanging at the end of the game -- there were several characters that barely were in the game at all, and there's the intriguing plot element that it was actually Ratok's "hero" father who had released Badu, the final boss of the first game. I figured this would be like Ys II, which was the conclusion to the story of Ys I. Unfortunately, Xak II has very little to do with Xak I -- Ratok's father doesn't appear in the game and is only mentioned, with no resolution to what happened with him and Badu. Two characters return from the first game but nothing they do or say really links to what happened in the first game. 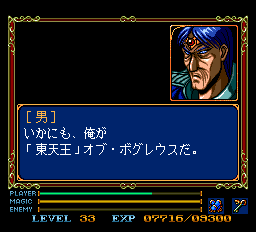 So Xak II begins with a cutscene. One of the disappointing things about this port is that there are only three places with voice -- the opening, ending, and the scene between I and II. They should have at least voiced some of the important dialogue during the game too. The cutscene is the very stereotypical anime/RPG thing with an evil boss Gospel and 4 underlings talking in vague terms about secret plans and killing the hero, blah blah. We then switch to Ratok, who has set out for Banuwa village for two reasons -- he heard his father had been seen there, and there's a doctor who can cure his mother's blindness. As it turns out Ratok will neither cure his mother nor find his father. Utter failure! Along the way he saves Shana from some goblins and leads her back to town. She normally lives in the forest. Then Ratok gets drawn into doing random jobs for the villagers -- he hears about the 4 people from the intro cutscene and agrees to go after the first one. Apparently Banuwa has one of the Xak Deepuls (Ratok used two of them in the first game) that is protecting the town, but that won't last long. Ratok retains his level, but has to give up all his equipment and start over with that. At this point I made a huge mistake. There's a new option in Xak II called "Force Shot" which you can turn on and off. The choice seemed to do nothing, so I ignored it and accidentally left it on. As it turns out, if you enchant your weapon at the magic shop, you can turn on Force Shot to shoot out energy. But this greatly weakens your defense. Without knowing this I was basically playing on hard mode for the first segment of the game, wondering why the enemies were doing so much damage despite having pretty good gear and levels. Once I figured this out the game got a lot easier. The first area is this forest, where Ratok meets Shana's grandmother (as a disembodied voice) and a traveling group including a bard, who play little role in the game. Ryun also returns from the first game -- his role in the first game was very limited, and it's limited here too. You have to go through this annoying part. If you even barely touch a pixel of one of the holes, it's instant game over. And those harpies knock you back with hits. So you have to save a lot, although jumping helps. Finally we reach the first of the four main bosses, Ob Bogleus. The strategy for bosses in this game is all the same -- turn on Force Shot and hold down the button, and the boss will die in a few hits without being able to move. I watched a video where someone did it without force shot and even then the bosses take 2-3 hits to kill. One reason for this is that it's very easy to overlevel. The designers did not copy Ys' system of reducing the XP you get for monsters as you level. This means it's very easy to level, and the further you go in the game the faster you level. You'll reach the max level of 50 well before the end of the game. After beating Bogleus we find Myun, a girl who looks exactly like Shana. Bogleus warns us not to let Gospel have her. Ratok also finds one stone. Next, the mayor asks us to go to the western valley to rescue his daughter and some other villagers. The boss here is Eb Feeru, who yields another stone. Next, Ratok takes a fountain teleporter to a castle to find the third boss, Val. This place has annoying jumping parts. You better save after each jump here, because if you're off by pixels it's an instant game over. I don't know who thought it was a good idea to put these jumping things in the game. Anyway, Val goes down instantly like all the other bosses, and Ratok gets another stone. For some reason the game forces you to be at max level to reach this boss, but the enemies give so much XP that's quite easy to do. The final dungeon requires taking a ship to get to, which brings back a number of the earlier characters from the game, none of whom really have any effect on the story or are very memorable. The ship is attacked by the final of the four generals, Rob Necromancer. As usual, holding down the shot button is instant death for the boss. Necromancer is able to sink the ship, and Ratok washes up on the beach with the final dungeon, Death Mountain. Ratok also receives the strongest sword, but there's some sort of bug which duplicates the 5th armor in the 6th slot; I don't know what was supposed to happen, but it doesn't really matter. The final dungeon requires putting all the 8 stones Ratok has collected (2 are in the dungeon) in various statues, opening the way to another dragon and another shooting scene like Xak I. It's as pathetically easy as the Xak I version. 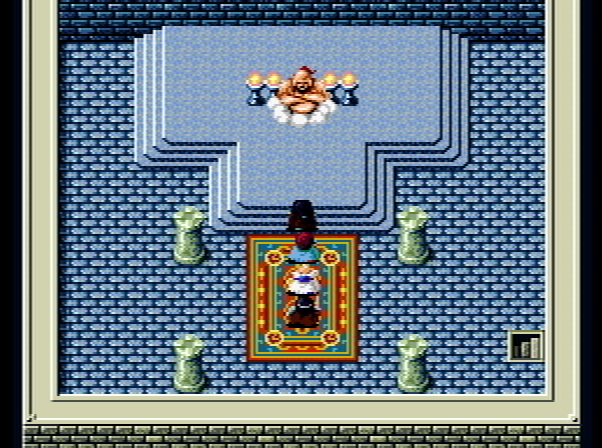 Now Ratok reaches the final boss, Gospel. He has two forms, but both of them go down instantly to force shot; I didn't even see what the second form really looked like since he was partially off screen. After beating the boss, Ratok reunites with his friends who survived the shipwreck. Pixie has now grown to full size (something about the energy radiating from Gospel) and so she gets to fight with Frey from the first game over him. Ratok then sets out for another adventure. To sum up: this is Ys, but worse in every way. It's not a terrible game, but if you've played Ys you'll just be wondering at every point why they made the decisions they did. The game is far easier. The plot is nearly nonexistent, with characters in the game who serve no purpose and are barely memorable at all. Ratok doesn't accomplish any of the goals he sets out to do, and the seeming promises of Xak I are not followed up on. If you really like Ys I guess this is worth playing since it's not very long, but they could have done a much better job. We'll be back to the Xak world in a while with Xak III, the last game in the series (other than a few side games). 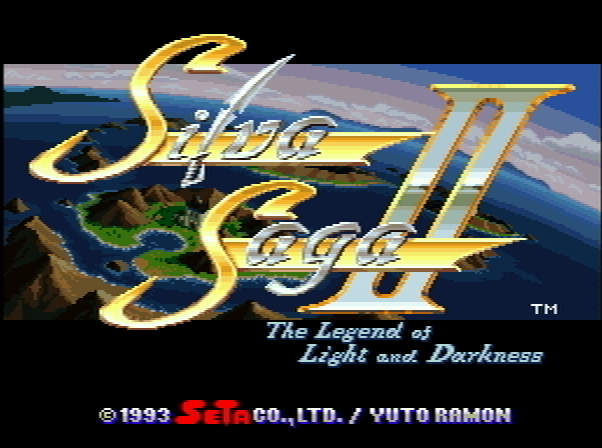 Next up it's back to the SFC with Silva Saga II.